Are you looking for the perfect cooler backpack? After doing extensive research and performing various tests on different cooler backpacks, we are convinced that the Polar Bear Coolers Nylon Series Backpack is the top cooler backpack available on the market. People who love spending time outdoors know there is no shortage of situations when having a cooler can save the day. The problem is, lugging a traditional cooler around is not the easiest thing and might end up ruining the fun for you. This is where backpack coolers come in handy. A backpack cooler provides an easy and convenient way of bringing some goodies from home to wherever the party is happening. All you need is to pack your snacks and beverages, throw in a couple ice packs and then sling it on your back like you would with a regular backpack. You leave your arms free to do as you please (which can make a big difference especially if you are hiking) and you don’t have to argue with security about whether containers are allowed at the festival or not. Since it is our mission to ensure you always have the best of the best, we did a test on various backpack coolers and compiled a list of the best backpack coolers to help you choose the perfect one for you. Here is our list of the 10 best cooler backpacks that are currently in the market based on features, carrying capacity and durability. The Polar Bear Coolers Nylon Series Backpack clinched the top position on our list of the 10 best cooler backpacks, and you’ll see why no other cooler backpack can stand up to it. Polar Bear is a highly reputable brand name that is known for delivering high-quality products day in and day out. The backpack measures 18 x 12 x 7 inches. This size allows it to hold up to 24 cans, which is more than enough for you and a few friends. Of course, you can put other stuff in there too. 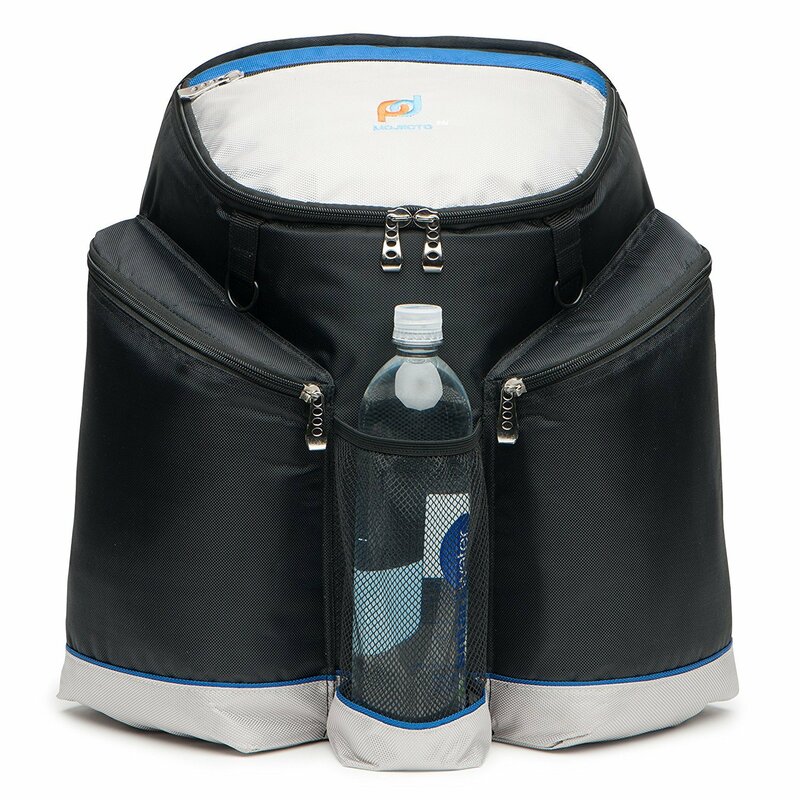 This backpack can easily hold 18 bottles or some other larger drinks that need cooling too. Also, the size of the backpack is large enough to keep you and your friends hydrated, but also small enough to comfortably carry around no matter where you go. The high-quality insulation on the Polar Bear has a one-inch thickness with a “5 layer air trap” design. This allows the backpack to keep your ice packs frozen for over 24 hours. 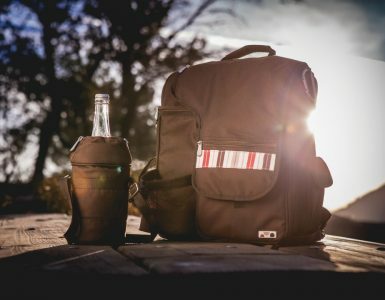 Keeping your drinks cold for an astounding 24 hours is something that is practically unheard of when it comes to a cooler backpack. For optimal performance, you should pre-cool your drinks and pack the backpack with enough ice packs. Having the drinks and ice packs already cold when you put them into the backpack will ensure that they stay cold for as long as possible. Having a very convenient to carry a backpack that keeps your beer and other drinks cold for more than a day is definitely a big bonus. Despite the inch thick insulation and big carrying capacity, the Polar Bear Coolers Nylon Series Backpack weighs a mere 3 pounds when empty. The extremely lightweight nature of the Polar Bear Coolers Nylon Series Backpack makes it a breeze to carry with you to the park, beach, or anywhere else where some cold beers are called for. The exterior of the backpack is made out of a tough 1000D Nylon shell that will take a beating without any signs of damage. It’s highly scratch resistant, it won’t tear, and it’s fairly soft, so dropping it is not a big deal either. The zippers are heavy duty weatherized, so you don’t have to worry about them coming off or getting damaged. The zippers open and close easily, but only when you want them too, thus creating a secure location to keep your beer or other drinks. The shoulder straps are soft for maximum comfort when wearing the backpack. They are soft, well-padded, and adjustable in order to make carrying the Polar Bear Coolers Nylon Series Backpack as comfortable as can be. For those times when you would rather carry it as a plastic or duffle bag, it also has a Velcro wrap for gathering small handles into a manageable bunch when you want to carry it in one hand. The Polar Bear Coolers Nylon Series Backpack comes with a number of pockets to help you keep everything in its proper place. Apart from the main cooling compartment, there is a rubber coated zipper pocket on the back, a handy mesh pocket, and two easily accessible side pockets. You can keep your keys, phone, a small speaker and all of your other essentials in the Polar Bear Coolers Nylon Series Backpack, thus eliminating the need to carry around more bags. It also has a pull-tap bottle opener built into the cooler, which is pretty handy for those times when everybody forgot to bring along a bottle opener. Talk of convenience! When empty, the backpack folds to half its size, therefore storing the backpack will not be much of a problem. It can easily fit in any closet or drawer. The Polar Bear Coolers Nylon Series Backpack is available in an array of colors to suit everyone’s preferences. OAGear Cooler Sports PackMade by Outdoor Active Gear, this cooler sports pack is one of the best cooler backpacks you will find on the market. This is a heavy duty backpack designed to give you hands-free convenience while carrying a ton on your shoulders. 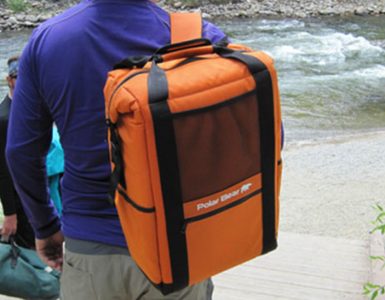 The backpack has a double heated PEVA liner that ensures that it remains leak-proof. There are tons of cooler backpacks out there, but the problem with the vast majority of them is that they leak. Once your ice or ice packs melt, the bottom often becomes saturated with water. This is not a problem that you will ever have with The OAGear Cooler Sports Pack. There is also the fact that The OAGear Cooler Sports Pack is extremely tough and rugged. You can put this thing through some serious challenges without fear of it ripping, tearing, or breaking. This cooler backpack is meant to be heavy duty and that is exactly what it is. The OAGear Cooler Sports Pack measures 12.25 x 16.5 x 7.75 inches. The large size allows it to hold approximately 20 cans plus ice, allowing you to bring the party wherever you go. You can also keep beer bottles or larger liquor bottles in it with ease. 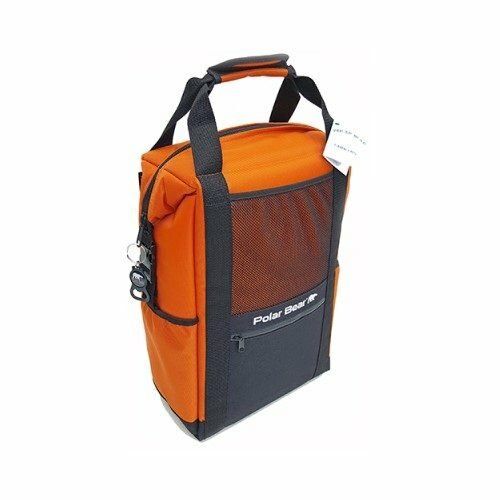 This backpack is great for keeping a lot of drinks crisp and cold, plus it can even be used for some food items too. Whatever the case may be, there is more than enough room in The OAGear Cooler Sports Pack for you and your friends. The large front pocket, drawstrings, and open mesh side pockets give it a cool, sporty look. Not only does this give it a sporty look, but it also means that you can carry around your valuables and essentials without needing an extra backpack or bag. Convenience is definitely a big selling factor here. The backpack is designed in a way that allows it to sit securely on your back, ensuring complete comfort as you go about your activities. The design allows for even weight distribution, making your load easier to carry. The shoulder straps are padded, making the backpack easy to wear and taking the strain off your shoulders. This allows you to carry the backpack for greater distances effortlessly. The shoulder straps are also adjustable in terms of their size, making this bag easy to carry no matter what size you are. On that same note, the bag itself does not weigh very much, which means that being too heavy is not a big issue with The OAGear Cooler Sports Pack. The mesh side pockets on the side of the backpack provide some extra space and easy access, convenient for stashing a bar of chocolate, snacks or any other essential item you may prefer. Like we said before, convenience is a big factor here. 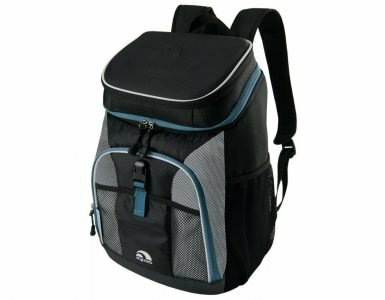 The OAGear Cooler Sports Pack is a great choice if you are looking for a heavy duty cooler backpack that will hold a large number of drinks. The price is quite pocket-friendly. As a plus, it looks just like an ordinary backpack, which makes it perfect for sneaking your own drinks into a sports event. It’s a great option for the beach, the park, sporting events, or even just for your own backyard too. The Coleman C003 soft backpack cooler is a stylish and large backpack that can carry up to 28 cans, making it the perfect choice for large families or extended outings. In other words, The Coleman C003 soft backpack cooler is actually one of the larger cooler backpacks on the market today, which for you means that running out of refreshing drinks is not something that will readily happen. It measures 12.2 x 6.3 x 19.3 inches. We do really like the size of this cooler backpack because it is more than large enough to carry a whole lot of drinks, but also small and compact enough to carry around for hours on end without too much trouble. There is also the fact that the bag itself does not weigh very much at all, making it just that much easier to carry around with you no matter where you go. 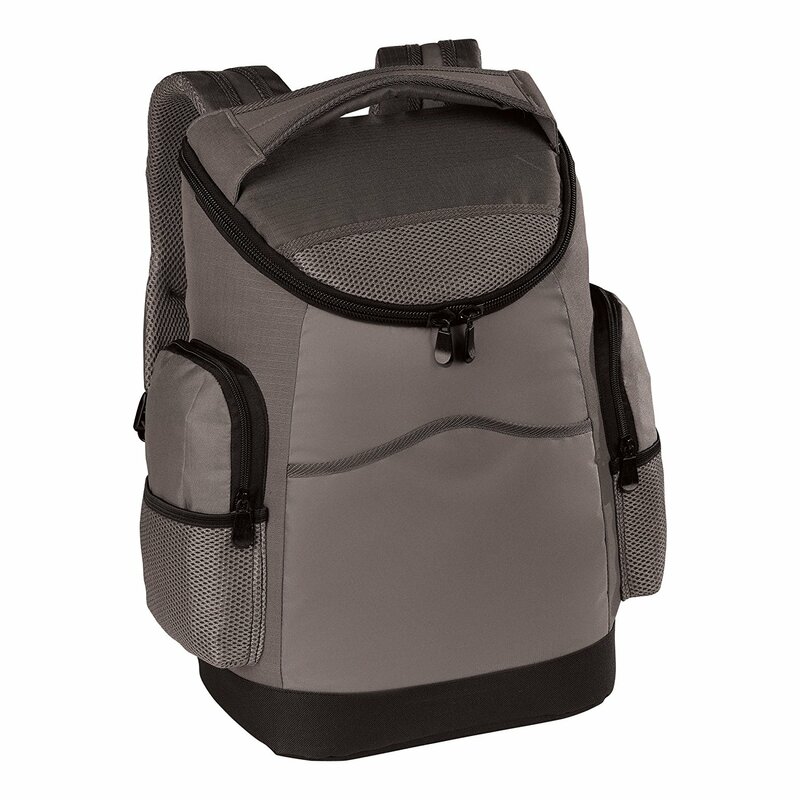 The backpack is comprised of the main cooler compartment, a dry zippered front pocket and two small mesh pockets on the sides, near the base of the backpack. It actually looks more or less like a regular backpack that you might to work or school. The main cooler compartment is made from a durable, BPA and phthalate free, heat welded material that enables the backpack to keep drinks and snacks cold for extended periods. It’s also good to note that the lining of the main compartment is mold, odor and mildew resistant. There are a couple of main takeaways here. First off, being BPA and Phthalate free means that this backpack is fairly environmentally friendly, plus it is safe to keep your drinks and food in too. Second, your beer, drinks, ice packs, and/or ice will stay cool for up to a whole 24 hour period, thus ensuring that you have cold drinks all throughout the day and night. Moreover, the heat welded seal on this bag means that leaking is not an option. Even when the ice or ice packs do start to melt, the water will not just leak out the back and down your legs. Finally, this also means that The Coleman C003 soft backpack cooler is fairly durable too. No, it is not made of titanium, but it is more than durable enough for some camping, beach, or sports trips. While the mesh pockets provide extra space for holding small items, they do not have zippers, which means they are not ideal for holding valuable items such as cellphones, keys or wallets. Instead, these can be kept in the zippered dry storage pocket located on the front panel of the Coleman. This pocket is large enough to hold an iPad mini or any other small tablet. It can also be used for storing snacks that do not need cold storage. 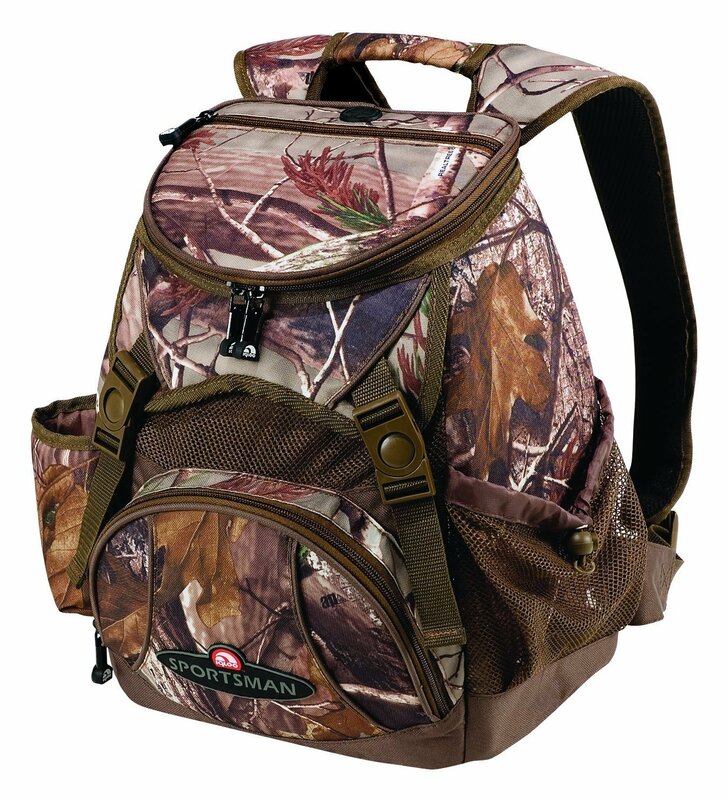 The Coleman C003 soft backpack cooler is designed to be stylish, lightweight, comfortable and spacious. It comes with fully adjustable shoulder and waist straps, which are fully padded to ensure carrying comfort. The waist straps have a wide base to prevent them from cutting into your sides due to the weight of the bag. The back area of the Coleman is also padded, not only to provide comfort but also to ensure that your back does not get cold. In other words, when it comes to carrying around a bag full of cold drinks and ice, The Coleman C003 soft backpack cooler is specially designed to make it as easy as possible for you. Igloo is a renowned brand in the cooler backpacks space, with the Marine Ultra Square being among one of their best offerings. The marine cooler backpack is resistant to leaks and is very easy to clean. It is made out of anti-mildew and UV protected outer material. In other words, this cooler backpack is not going to get all moldy and smelly when it stays wet for too long. At the same time, the UV resistant outer casing means that the sun’s rays are warded off so that your beer can stay cooler for longer, plus it also helps to increase the lifespan of the color of this backpack. The fact that you can simply wipe it down with a cloth when it comes time to clean the Igloo Marine Ultra Square Cooler is another big bonus no doubt. One of the key features of the Igloo Marine Ultra Square Cooler is the MaxCold Insulation with 25% more foam. This feature allows the Marine to keep your snacks and beverages cold for extended periods of time. It is specially fitted with extra 1.1-inch thick extruded closed cell foam with a 0.35mm thick PEVA that enables it to keep ice for up to two days. Being able to keep ice frozen and your drinks cool for a full 2 days is virtually unheard of when it comes to cooler backpacks. We cannot stress just how impressive this actually is. The backpack measures 8.5 x 16 x 11.75 inches, making it quite spacious, with a capacity of up to 24 cans. Being able to fit 24 cans into the bag is more than enough for you and a couple of friends. It also allows for the storage of regular sized bottles, wine bottles, and other drinks too. Heck, you can even put some food in there too if you choose. We do like that the Igloo Marine Ultra Square Cooler is large enough to fit lots of drinks, but also small and lightweight enough to carry around all day without getting fatigued. It has a good shape and size to make life a lot more convenient for you. Also, when it comes time to but the Igloo Marine Ultra Square Cooler away, it can easily fit into most drawers and closet shelves. The marine cooler backpack is designed to suit your lifestyle. In addition to the various pockets, it has adjustable straps fitted with breathable material, which allows for cooling and extra comfort. It also has a chest clip that comes in handy especially when you need to carry heavier goods. The various extra pockets it comes with are great for storing your keys, phone, wallet, and other important items without needing an extra bag with you. The Marine is made to be used in marine environments, therefore it is built using non-corrosive hardware that will comfortably handle the cruel marine conditions. It won’t corrode, rust, get smelly, and it can float too. Even with lots of drinks in it, the Igloo Marine Ultra Square Cooler will actually float in the water instead of sinking. The antimicrobial liner is both odor and stain resistant and allows for easy cleaning. It has a fully insulated compartment that will provide full protection to the chill fragile products inside. The Igloo Marine Ultra Square Cooler comes at a reasonable price. However, some users have raised complaints about the zippers and handle stitching. The Picnic Time ‘Zuma’ Insulated Cooler Backpack is a stylish backpack that can be easily mistaken for an ordinary backpack. This is actually a really useful aspect because it allows your drinks to go unnoticed no matter where you go. At the same time, if need be, you can also use The Picnic Time ‘Zuma’ Insulated Cooler Backpack as a regular backpack for carrying around things other than drinks. However, unlike a regular backpack, it comes with a water-resistant, heat-sealed lining that allows it to keep your snacks and beverages chilled while you are out on your adventures. In other words, even when the ice does eventually melt, at least the water will not leak down and get you all wet and cold. The Picnic Time ‘Zuma’ Insulated Cooler Backpack is made out of a kind of polyester that is both light and durable. Being lightweight is a big bonus because it makes this backpack cooler easy to carry around. Also, the fact that it is torn and rip resistant, plus the fact that dropping it won’t damage it, are also big bonuses no matter who you are. Measuring 19 x 11 x 7 inches, the backpack is spacious enough for most of your outdoor requirements. It can hold up to 16 cans with ice packs or up to 20 cans without ice packs if the cans are already chilled. This is more than enough cans, or even bottles, to keep you and your friends satisfied for the whole day. At the same time, the bag is small enough to make carrying it around all day easy and comfortable. The Picnic Time ‘Zuma’ Insulated Cooler Backpack is divided into two sections. The upper section, which is fitted with a drawstring closure mesh, is reserved for storing goods that do not need to be kept chilled. You can keep virtually anything you want in those pockets including small laptops, food, and other things too. The bottom section, which is the main cooling compartment, is fitted with Thermo-guard insulation, is heat-sealed and has a water-resistant lining. Your beer or other drinks will stay cold for hours on end, making it the perfect option for being outdoors on a hot summer day. The exterior of the backpack has zippered pockets that provide extra space for storing your other stuff. Carrying your phone, keys, and other items with you is not a problem with The Picnic Time ‘Zuma’ Insulated Cooler Backpack. The lining is heat sealed and water resistant to prevent leaks. The padded shoulder straps are equipped with a breathable mesh material that makes it comfortable to carry the backpack for extended periods and keep you from sweating. You can adjust these well-padded shoulder straps to fit your size, making it cool and comfy to carry around on a hot day. On the underside of the shoulder strap is a small pocket which can be used to carry a mobile phone, allowing for easy access to your phone in case you need to need to make a quick call. The Picnic Time ‘Zuma’ Insulated Cooler Backpack is available in a number of colors, including blue, red, black and black US army, thus making it ideal for men, women, and people with different senses of style. The Igloo Real Tree Soft side Hunting Cooler Backpack is perfect for hunting trips and other varied outdoor activities. The reason why it is so perfect for hunting trips is that it features a camouflage color scheme which is ideal for the forest. This means that you can take the Igloo Real Tree Soft side Hunting Cooler Backpack hunting with you without fear of your prey seeing the bag and making a run for it. Having cool drinks with you is always essential to have a good time while hunting. The backpack measures 9.8 x 19.3 x 13.8 inches. This provides ample space to carry up to 18 cans, which is more than enough hydration for you and some friends while out on a full day hunting trip. It can fit more than enough cans while at the same time being compact enough to be easy to carry with you along with your other hunting gear. The Igloo Real Tree Soft side Hunting Cooler Backpack is built with a cool outer fabric design that is outfitted with authentic Real Tree Camo print. This is something that most outdoor enthusiasts will love. Being out in the woods can be rough and tough, which means that things can get damaged and break. However, the Igloo Real Tree Soft side Hunting Cooler Backpack is very tough and resistant to all kinds of damage, thus making it the perfect option for a hunting trip in the wilderness. 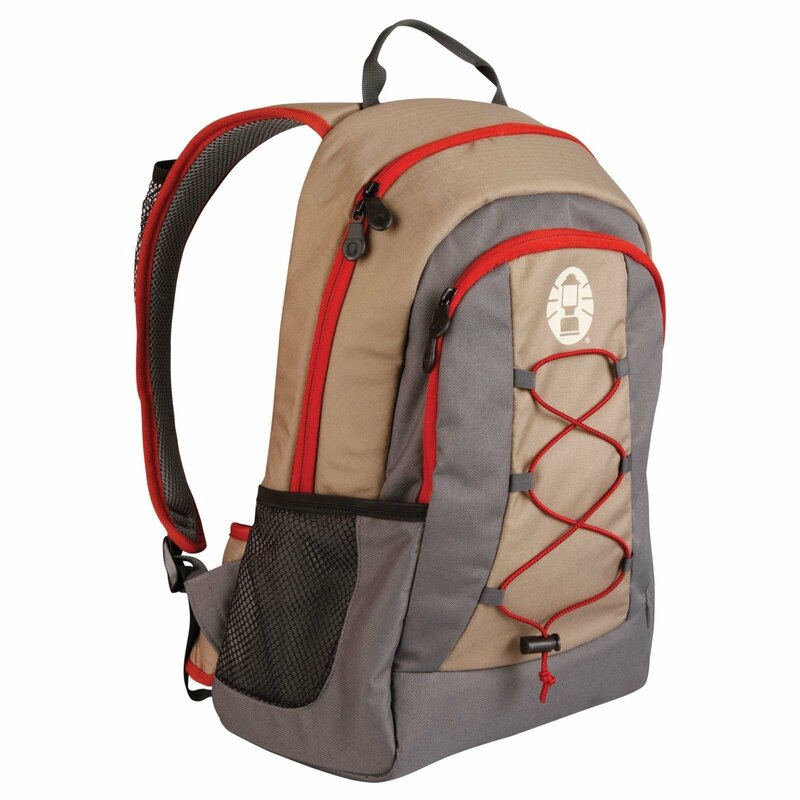 The main compartment of the backpack is insulated, allowing it to keep your food and drinks insulated all day long. That is right, not only can you keep your drinks cold in this cooler backpack, but you can also put food in it, making it a great lunchtime or picnic bag whenever you go for a hunt. Apart from the main compartment, it has other exterior pockets for storing extra snacks and gear. These include one zippered pocket on the flap, another zippered pocket on the front of the backpack and two meshed pockets on either side of the backpack, near the base. You can store snacks, keys, phones, emergency gear, and other hunting equipment in any one of these pockets, thus decreasing the need for other bags and packs. The main compartment of the Igloo Real Tree Soft side Hunting Cooler Backpack is made out of a light but strong molded EVA foam that makes the compartment crushproof, keeping the fragile items inside both cold and secure. This is true to the point that you could even keep glass bottles inside of the Igloo Real Tree Soft side Hunting Cooler Backpack without them smashing. It also has a leak resistant, antimicrobial lining that can be cleaned easily. The ice that melts will not leak out over your legs, thus keeping you dry, plus the liner makes sure that mold and bacteria do not grow. It helps the backpack stay smelling and looking great. The shoulder straps are padded, adjustable and are covered with a breathable mesh, making the backpack very comfortable to carry. It makes this bag really easy to carry around with you no matter what size you are, how much you have in the bag, and no matter how hot it is outside. Some users have raised some complaints about the quality of the shoulder strap stitching and the zippers. However, the Igloo Real Tree Soft side Hunting Cooler Backpack comes with a one year manufacturer’s warranty against any material or workmanship defects, therefore if you find any of these problems, you can get in touch with RealTree and they will replace the backpack for you. The Turismo cooler backpack is among one of the coolest offerings you are going to find on the market. It packs a lot of storage space, has a very sleek design and comes with a nicely designed and insulated water bottle holster, complete with the water bottle itself. Sometimes you need to drink water, and whether you are at the park, the beach, school, or work, having a cold bottle of water on a hot summer day is both refreshing and healthy too. On a side note, the fact that the backpack looks really sleek is a big bonus too. It is not only useful, but stylish too, or in other words, you get the best of both world here. It is designed to be a backpack with a cooler, rather than a cooler with shoulder straps. What is meant by this is that it looks more like a backpack than anything else, making it easy to sneak into sporting events or taking it to the beach without anybody giving you trouble? Heck, you could even use the Turismo cooler backpack as a normal backpack for school and work, using the cooler compartment to keep your lunch, dinner, and snacks cool. The backpack measures 19 x 16 x 5 inches. This allows you to carry up to 12 cans with you. No, the Turismo cooler backpack is not the biggest cooler bag in the world, but 12 cans are still quite a bit of liquid. You could also fit something like 9 beer bottles in it too, making it more than roomy enough to supply you with ice cold drinks all day long. The Turismo cooler backpack has two main insulated compartments, which are covered by a fold over flap. The fold-over flap itself has two zippered pockets for extra storage. Below the fold over flap is a hidden zippered compartment, while on each side you will find smaller pockets which can be used to hold cell phones or keys. The water bottle is removable and has an adjustable shoulder strap. Being able to carry around items other than drinks is a big bonus no doubt. The insulated interior compartments on the Turismo cooler backpack will keep your beverages chilled for up to 12 hours. 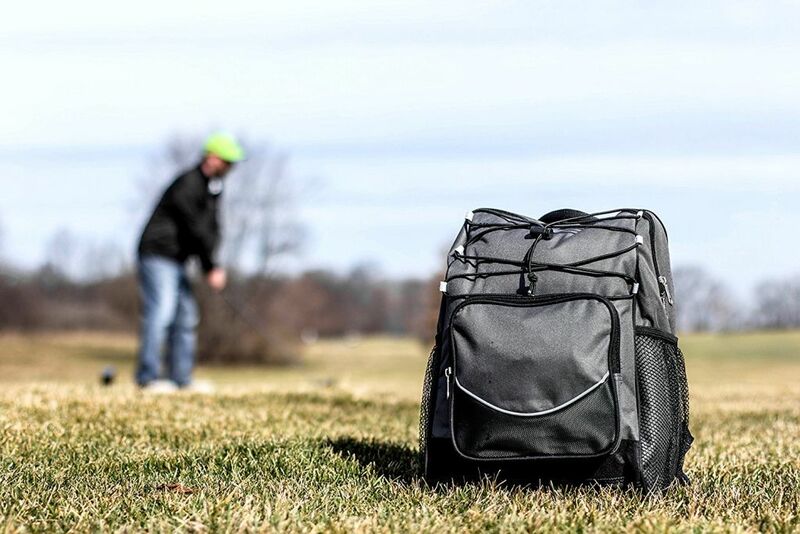 12 hours might not be quite as long as some of the other options we have looked at, but then again, it is still a lot longer than the majority of other cooler backpacks on the market today. The backpack is fitted with non-slip, extra comfort shoulder straps, which provide more comfort as compared to standard padded shoulder straps. It also has a padded handle grip at the top. You can adjust the shoulder straps to fit your size for comfort, or you can choose to use the handle to carry it around like you would any other kind of bag. If you are in the market for a versatile and sleek cooler backpack that you can use for hikes, sightseeing, vacations, field trips, beach trips, and amusement park trips, the Picnic time ‘Turismo’ Insulated Cooler Backpack is a perfect choice. It’s a very durable and lightweight option that is easy to carry around and can be easily stored in a drawer when it comes time to put it away. It is also backed by Picnic Time family of brands ‘built to last’ lifetime guarantee. The OAGear Ultimate Backpack Cooler is the perfect choice for people who have frequent outdoors adventures. The sturdy backpack is made of 600D polyester and a 600D rip-stop trim, making this one of the most durable cooler backpacks you are going to find on the market. It won’t rip from getting caught on a branch, a heavy load of drinks won’t break it, and neither will a drop from a pretty significant height. Apart from the highly durable polyester exterior, the OAGear Ultimate Cooler Backpack is also fitted with heavy-duty, thick PEVA liner on the interior. This means that you could probably keep some glass bottles inside of this backpack without fear of those bottles smashing in the event that you drop the backpack by accident. It is also fitted with a bottom board which allows the cooler to easily stand by itself. Few cooler backpacks can match the durability provided by this backpack. The fact that the OAGear Ultimate Backpack Cooler is so extremely durable is one of the biggest selling factors which it brings to the table. The OAGear Ultimate Backpack Cooler measures 5.4 x 15.3 x 19.6 inches, allowing it to hold up to 20 cans plus ice packs. Being able to carry around 20 cans or roughly 14 bottles of cold ones with you is a really nice advantage when it comes to any hot day at the beach and for any sporting event too. Despite its huge capacity, the backpack remains pretty compact and can be carried quite easily. It is not actually all that big, plus it is fairly lightweight when it is empty, making it one of the most convenient cooler bags to have with you no matter what the case. It comes with adjustable shoulder straps that are padded with breathable mesh material for enhanced comfort as you carry the backpack. The shoulder straps feature some really good padding for comfort, they can be adjusted for size, and they won’t make you sweat like crazy either. It has heavy-duty zippers which will serve you for years without ripping. The zippers are easy to open and close, they are very secure, and they won’t fall apart on you either. It has a smart, simple design. 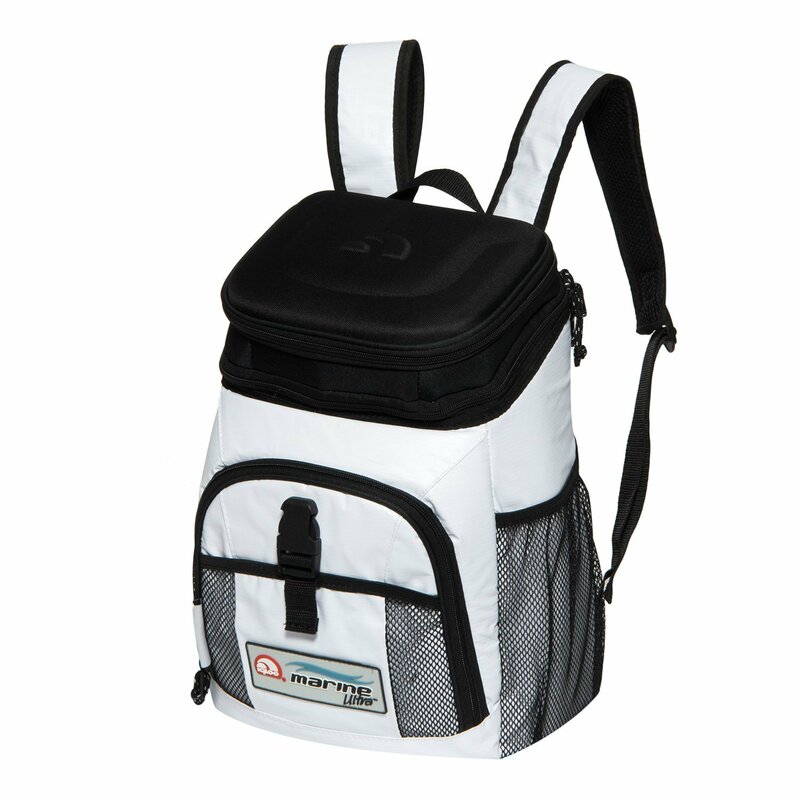 It has one main compartment which is insulated to keep your snacks and beverages cold as you enjoy your excursion. This compartment has the ability to keep your drinks cool for a whole day at least, thus ensuring that you always have a cold drink when you need it. The compartment is insulated in such a way that it won’t allow the ice to melt. Yes, the ice will melt eventually, but even when it does, the special leak-proof design of the OAGear Ultimate Backpack Cooler ensures that the water stays exactly where it needs to stay, in the bag and not on your legs. On top of the main compartment is a zippered front pocket that can hold a cell phone, map, keys or any other small stuff you want to bring with you. On each side, you will find an easy-to-reach extra pocket where you can stow your water or soda bottle. Being able to carry around more than just cold drinks is always a big advantage no matter where you go. One of the differences between the AO cooler backpack and most other cooler backpacks is that it is actually made of fabric. We do like how this particular cooler backpack is made of fabric because it helps provide a sleek, natural, and inconspicuous look that you just can’t find with other cooler backpacks. You can use this cooler backpack for keeping drinks cold at the park, beach, or sporting event. 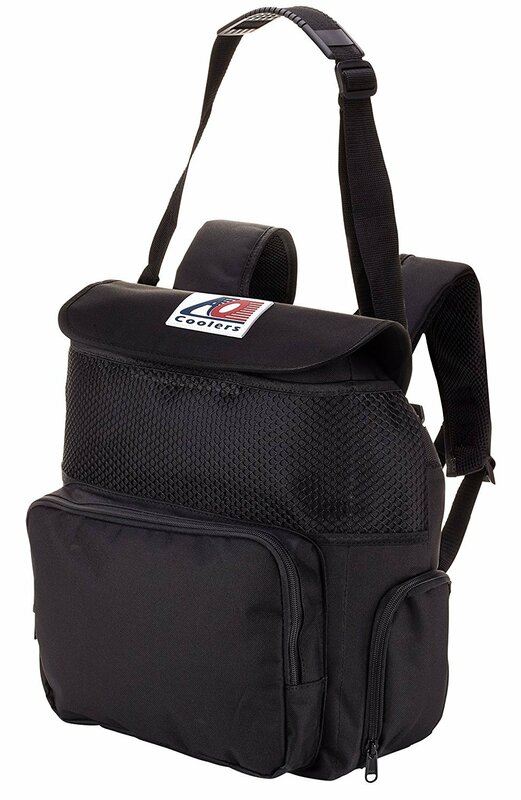 Also, you can use the AO Coolers Backpack Soft Cooler for keeping your lunch and drinks cold at work or at school. The really nice look at this backpack means that you can use it for school, work, fun, and much more. In spite of being made of fabric, its insulation properties are twice those you will find on regular cooler backpacks. The AO Coolers Backpack Soft Cooler can keep your drinks cold for a whole 24 hour period and then some. This is not something that can usually be expected from a fabric cooler bag. Even the hottest day at the beach will not cause the ice to melt quickly. Good insulation is a big selling factor with the AO Coolers Backpack Soft Cooler. The AO Coolers Backpack Soft Cooler also comes with a leak-proof liner that prevents the backpack from leaking in the case of spillages. Even when the ice does eventually melt, at least it won’t leak everywhere. Another unique thing you will notice with the AO coolers backpack is that it is designed in such a way that it can be used both as a backpack or a duffel bag. If you do not want to carry it on your back, you simply need to attach the removable shoulder strap, allowing you to carry it as a duffel. The backpack measures 16 x 7 x 14 inches. This size allows it to hold up to 18 cans. 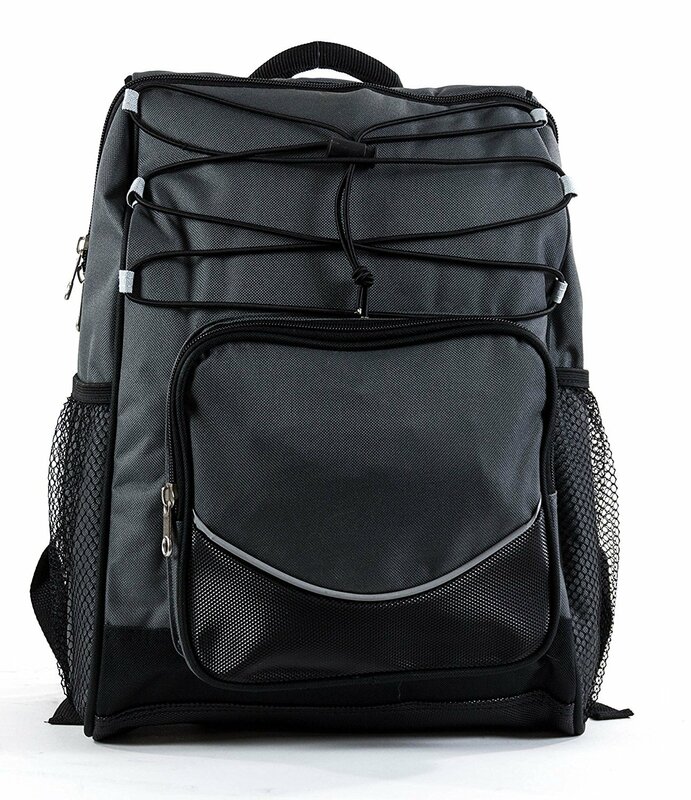 This makes it an ideal cooler backpack whether you are alone or with a couple of friends. It can hold 18 cans or roughly 12 bottles, plus it has some extra room for sandwiches and other snacks too. The ¾ inch, high density closed cell foam insulation works as advertised – it will keep your snacks and beverages chilled for up to 24 hours. Apart from the main insulated compartment, the backpack also boasts one large front pocket and two small side pockets, which can be used for storing dry items. You can put sandwiches, phones, chips, wallets, keys, and whatever else into these pockets for easy storage. 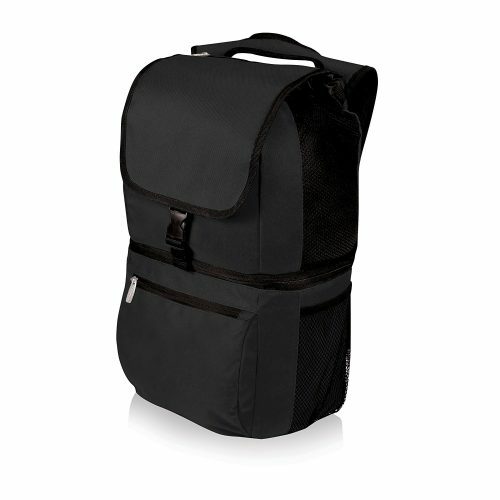 The shoulder straps on this backpack are fitted with extra thick padding for maximum comfort when wearing the bag. The shoulder straps are nice and soft, allowing you to carry the AO Coolers Backpack Soft Cooler around all day long with ease, plus they can be adjusted for size too. It also comes with a shoulder strap and a chest clip, which means that you can carry the AO Coolers Backpack Soft Cooler in more ways than one. The exterior material of the AO Coolers backpack soft cooler is resistant to tears, impacts, and abrasions, making the backpack quite durable as well. In fact, the material used is specially designed to be as resistant to damage as possible. Just like its name suggests, this is a big cooler backpack. It has the capacity to hold up to 40 cans (355mls) without ice packs. In other words, this particular cooler backpack can hold more cans and/or bottles than any other option we have looked at here today. It has more than enough capacity to hold both cold drinks and snacks for you and multiple friends, thus keeping you supplied, happy, and full of drinks all day long no matter where you go. It is made from heavy-duty 1680D tear resistant commercial grade polyester fabric, unlike the 600D, 400D and 300D polyester fabrics that are commonly used on regular cooler backpacks. The fact that the Mojecto Heavy Duty Large Cooler Backpack is extremely durable is absolutely necessary. It can resist tears, rips, and impact too. It can hold a whole lot of drinks, so it needs to be made of very durable materials in order to easily hold it all without fear of the whole thing breaking. The inside is layered with high-density thick foam insulation and thick, heat-sealed removable PEVA liners, thus making it just that much more durable. Moreover, the heat-sealed PEVA liners help to ensure that your drinks stay cold and crisp for as long as possible, up to a whole day if need be. The stitching is strong, the zippers are large and tough, while the shoulder straps are padded and adjustable for enhanced comfort. The fact that the shoulder straps are well-padded, adjustable, and breathable are all things which help add to the versatility and the comfort you get with the Mojecto Heavy Duty Large Cooler Backpack. Clearly, the guys at Mojecto did not scrimp on quality with this backpack. 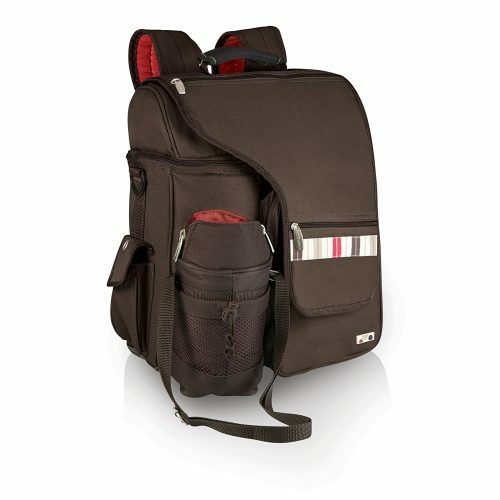 The backpack has an insulated central compartment which keeps your drinks and snacks chilled. Apart from the main compartment, there are two fully padded and zippered pockets for keeping things that need to be kept dry and other accessories. In between these two pockets is a meshed pocket for holding a water bottle. Water is always important on a hot summer day, On top of the main compartment flap is another zippered pocket that you can use for napkins and other stuff. It also has two large D rings on the sides for your keys. Talk of enough space for everything! You can easily carry your phone, keys, wallet, and other items with you when you have the Mojecto Heavy Duty Large Cooler Backpack on your back. The thick insulation on the backpack provides maximum cooling efficiency. However, it is good to note that that the Mojecto Large Cooler Backpack is not meant for use with open liquid, open ice or homemade plastic ice packs. Instead, make sure you use it with ice packs and ice gels that are meant for use with cooler backpacks. The Mojecto Heavy Duty Large Cooler Backpack will prevent condensation from leaking through, as any good cooler backpack should, but it will not stop whole piles of melted ice. Mojecto provides a worry-free, no questions asked lifetime warranty against material and workmanship defects. If for any reason you are not satisfied with your backpack, you will get a replacement or refund. A good cooler backpack is a great investment for those who like spending lots of time outdoors. Not only does it help to keep your drinks chilled for a more fulfilling taste, it also ensures your safety by preserving your foodstuffs, especially those that tend to decay quickly. Have you ever wondered how cooler backpacks work? Cooler backpacks operate by simply following the principles of aerodynamics, specifically by preventing or reducing convection and conduction, which are processes by which heat is transferred from one object to another. Cooler backpacks minimize these processes by keeping their interiors insulated from the exterior environment. Traditional ice chests use a layer of dense Styrofoam in between a double wall to provide insulation. However, though Styrofoam is a good insulator, it requires a relatively thick Styrofoam layer to keep the internal temperatures insulated. Additionally, Styrofoam is not flexible, which means it cannot be used in cooler backpacks since the backpacks are not rigid. Instead of Styrofoam, the exteriors of cooler backpacks are made using heavy but flexible fabrics, such as polyester. The interior is fitted with heavy-duty foil lining. In between the heavy outer fabric and the heavy duty inner foil are layers of thin but dense, flexible foam-like materials. This setup helps to maintain the internal temperatures of cooler backpacks for quite a long while. This allows for the manufacture of thin and flexible backpacks of various shapes and sizes that are easy and convenient to transport. Ideally, you should go for a backpack that allows you to carry as much food and beverages as you want without the fear that they won’t fit or that your backpack will hang too loose. Apart from your snacks and drinks, you might also need to carry along some other stuff, could be a few electronic gadgets, napkins, keys, etc. Generally, the rule of the thumb is the more pockets on the backpack, the better. This ensures you have space for everything you want to carry with you. The fact of the matter is that you don’t want to be out and about only to realize that you don’t have enough space for everything. Yes, the main purpose of these bags is to keep your drinks and food cold and fresh, but that does not mean that these backpacks can’t act as normal backpacks at the same time. Being able to carry around everything you need for a long day out is definitely something that you need to keep in mind. You don’t want to have to carry around an extra backpack, duffle bag, or other plastic bags when you already have a backpack on your back. Another thing that you might want to keep in mind is what the cooler backpack in question looks like. Some cooler bags look like coolers with carrying straps, while others look more like good old backpacks that also happen to keep drinks cool. Sure, a cooler bag that looks like a cooler with straps is fine if you are just going camping or to the beach, but it may raise suspicions otherwise. Having a cooler backpack that looks more like a general use backpack than a cooler with straps is always a bonus. Not only will it allow you to carry the bag around without drawing too much attention to yourself, but it will also allow you to use the bag for more than just fun. A cooler bag that looks the part can be used for work, school, and fun all at the same time. The look of the cooler bag you buy might come in second to its function, but if you ask us, it is still pretty important none the less. This depends on how you are going to use your backpack. The general rule of thumb here is that the bigger the bag is the better. If you only need to carry around drinks and snacks for yourself, this might not be as important to you. However, if the aim of the backpack is to be able to carry 24 cans of cold ones, plus some snacks, for you and your friends, you will definitely want to look out for a larger cooler backpack. Nobody wants to run out of drinks after just a couple of hours, especially when the store is so far away, which means that being able to carry plenty of drinks is a must-have feature for any cooler backpack. Now, if you are big and strong, carrying a lot of drinks is not going to be a problem. However, if you are a smaller person, you might need to sacrifice some storage space for an option that you can actually manage to carry around for a prolonged period of time, even when the bag is full. On that same note, is the bag small and compact enough to fit in your car, your closet, and your bedroom drawer when not in use. There are a few different questions you need to ask yourself in terms of the size when buying a cooler bag. Are you going to carry stuff for yourself only or for a group of people? Will you need to carry a lot of stuff? You should choose the size of the backpack depending on the number of things that you need to carry. Comfort is one of the key things you should keep in mind when buying a backpack, regardless of whether you want to carry foodstuffs or anything else. You are going to be carrying these bags around with you for a prolonged period of time, so having a comfortable cooler backpack is definitely a big deal. Think about where you will be taking the backpack with you. Will you need to carry it for extended periods of time? Will you be carrying lots of items in it? Carrying something heavy on your shoulders for extended periods of time can be very comfortable and might cause strain on your shoulders. If you will be carrying a lot of items or if you will need to carry the backpack for extended periods of time, you should go for a backpack with thick padding, both on the shoulder straps and on the lower back. This is essential for comfort no doubt. A backpack without good shoulder padding and good back support will be painful to carry around for an extended period of time. Also, the straps need to be adjustable for size. Backpacks are not a one size fits all kind of thing. Different sizes of people are going to need straps of varying lengths. Moreover, it also helps if the shoulder straps have some kind of mesh integrated into the design. This will help keep the heat at bay and stop you from sweating too much while carrying the cooler bag around with you all day. It also helps if you have a stomach strap or chest straps in order to help the bag balance better and to provide you with more support. Another thing you need to consider when thinking about comfort is the weight distribution. While some people prefer one-strap backpacks since they look cool, they can provide a lot of discomforts if you have to carry them for long or if you have to carry a huge number of items. You should go for a two-strap backpack that provides even weight distribution. You definitely do not want your bag or shoulders hurting after just a couple of hours of carrying the cooler bag around. A cooler backpack’s durability is generally determined by the kind of materials used to manufacture the backpack. Though the majority of cooler backpacks are made out of polyester and nylon, you might also find some that are made of fabric and canvas. When it comes to durability, nylon backpacks are the most durable, since nylon is a more expensive and tougher version of polyester. The main point here is that the cooler backpack needs to be strong enough to carry a lot of drinks without ripping, tearing, and sending your precious drinks tumbling down to the ground. Moreover, a cooler bag that has lots of padding also helps add to its durability. Not only does the bag itself need to stay whole, but the contents too. Having a decent amount of padding will mean that even glass bottles won’t smash in the event of you dropping the bag. Additionally, it also has better leak-proof properties. Though you might find some backpack brands using high-quality polyester whose waterproof properties are almost similar to nylon, it might not be as durable as nylon itself. However, there may be exceptions where the polyester is used in combination with nylon. The main takeaway here is that ice will melt, so you need a bag that can keep the water on the inside, stop it from spilling, and stop it from leaking out all over your legs as you carry the bag around. If possible, you should avoid canvas and fabric since these materials do not do an excellent job of keeping the warm air out of the interior of your backpack. Their leak-proof properties are not the best either, though there could be some exceptions. Some cooler backpacks are only meant to be used with sealed ice packs instead of loose ice, so this is definitely something to keep in mind. The main purpose of your cooler backpack is to keep your drinks and snacks crisp and cool, so it better be able to do that job without question. Good PEVA liners or other such heat-sealed liners, foam lining, or any other kind of insulating material is a property that any good cooler backpack needs to have. The point is to keep your drinks cold, in which case good insulation is absolutely necessary. You should always read the description of the bag you are looking at. Some cooler backpacks can keep drinks cold for 12 hours, while others can go for an astounding 48 hours. Where and how do you intend to use your cooler backpack? Will it be a replacement for your lunch cooler? Will you need to use it on your next fishing trip or on a hike up the nearby mountain? Your intended use will determine the kind of backpack you need to choose. You should also consider if you want to take the bag on hunting and camping trips with you. As well, would you like to use the bag for school and work as well? All said and done, this is the most important consideration. Always go for the cooler backpack that will provide the best features and most benefits while still remaining within your budget. Even more important is if you do spend a fair amount of money, does the cooler backpack in question feature all of the above properties? If you spend quite a bit of money on any cooler bag, it better has the properties and features we have been talking about here. All said and done, the best cooler backpack is one that will keep your snacks and beverages fresh and chilled throughout the day, even on the hottest summer days. We hope that after going through this review, you can identify a nice cooler backpack when you see it. We have also provided you with a list of some of the best cooler backpacks you are going to find on the market. According to our tests, the Polar Bear Coolers Nylon Series Backpack seems to be the best cooler backpack. Even so, the other cooler backpacks in this list are just as good, and it is up to you to make your choice depending on your specific needs and preferences. Whatever your choice ends up being in the end, all of the above cooler backpacks are great options, all of which we would recommend taking a closer look at.